Number three in our bridge-themed A-Zdvent calendar is the Jerusalem Chords Bridge by Spanish architect and engineer Santiago Calatrava, which is designed to look a giant harp. Calatrava has designed over 40 bridges in his career, but the Chords Bridge was the first to carry both trains and pedestrians. Completed in 2008, it stretches over a busy traffic intersection in the north of the Israeli city. The structure's most striking feature is a 188-metre-high pylon that cantilevers out at an angle to provide support for the 66 steel cables that hold up the bridge's 360-metre-long deck. 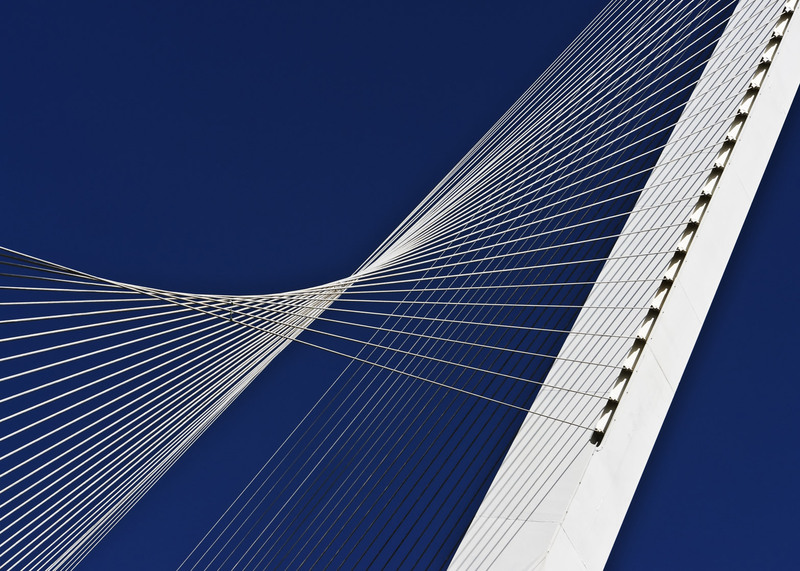 The form is reminiscent of some of Calatrava's other cable-stayed bridges, particularly the Puente del Alamillo in Seville, the Trinity Footbridge in Manchester and the Katehaki Pedestrian Bridge in Athens. The result is a streamlined structure that points towards the city centre, but also looks like it could topple at any moment. The architect claimed the form was inspired by the Harp of David, also known as the Kinnor Harp – the musical instrument played by the legendary biblical figure King David – providing a new symbol for the holy city. It is also known by the name Bridge of Strings. Writing for Time magazine at the time of completion, critic David Kaufman described the bridge as one of the city's most important architectural structures. "With historic landmarks such as the Western Wall and the Dome of the Rock, Jerusalem is hardly lacking in iconic architecture," he said. "But the city's latest aesthetic marvel, the Chords Bridge, is certainly the most impressive to debut in more than a millennium." Chords Bridge was commissioned as part of the Jerusalem Light Rail mass transit system project, which began in 1999. It is located near the city's central bus station, and carries Red Line trains across the junction of Jaffa Road and Herzl Boulevard. It has a gently curving S-shaped form, with the glass-walled pedestrian pathway incorporated into one side. The majority of the exterior is clad in pale Jerusalem stone, contrasting with the contemporary steel and concrete details. A public plaza was created underneath. In the spirit of an advent calendar, Dezeen will publish another bridge every day until Christmas. Letter A was Japan's Akashi Kaikyō Bridge, the world's longest suspension bridge, while B was Frank Gehry's serpentine structure in Chicago.